This adorable little white cotton blend baby dress is made by Feltman Brothers, a leading designer of classic baby clothes for 100 years. It features a scalloped edge yoke embroidered with a lovely blue design. This collar is edged with blue scalloped embroidery and both the collar and short puffed sleeves are trimmed with white lace. The dress is finished with a deep 5" deep hem. The dress closes in the back with two small buttons. 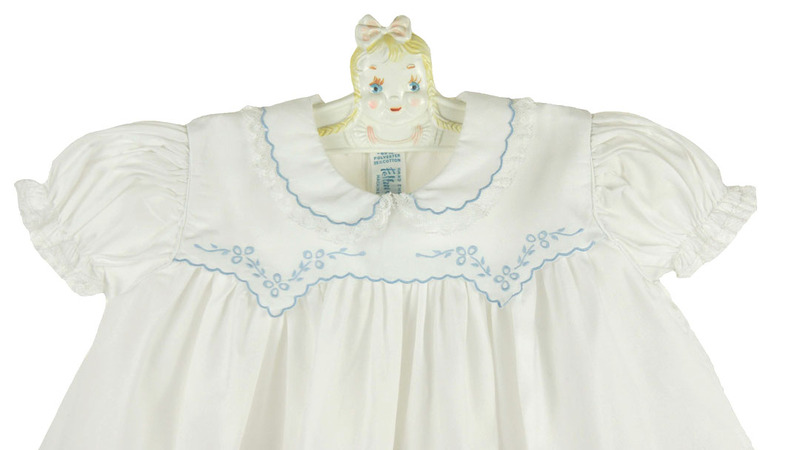 A darling portrait dress, christening dress or special occasion dress for your little angel! 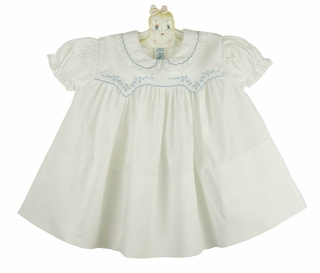 Note: This beautiful little dress is also available in white with pink embroidery. See below.